Sneaking extra light to your day | Chic first: an elegant view on beauty, fashion and lifestyle. Last week has been all about rediscovering old favorites I’ve always used for their ‘enlightening’ properties. I don’t know you, but I usually feel January as the longest and most difficult month of the year. It’s hard to get back to work after the Christmas holidays, the weather is still cold, and talking about beauty there’re three important concerns. First up, the skin requires extra care: from detox, to super-moisturizing treatment and preparations to the seasonal change. Our bodies need to recover after the long lazy weeks of doing nothing and eating too much. Whenever I feel the need of extra light to my face,without having to shop anything new, Guerlain’s Les Météorites come in help. 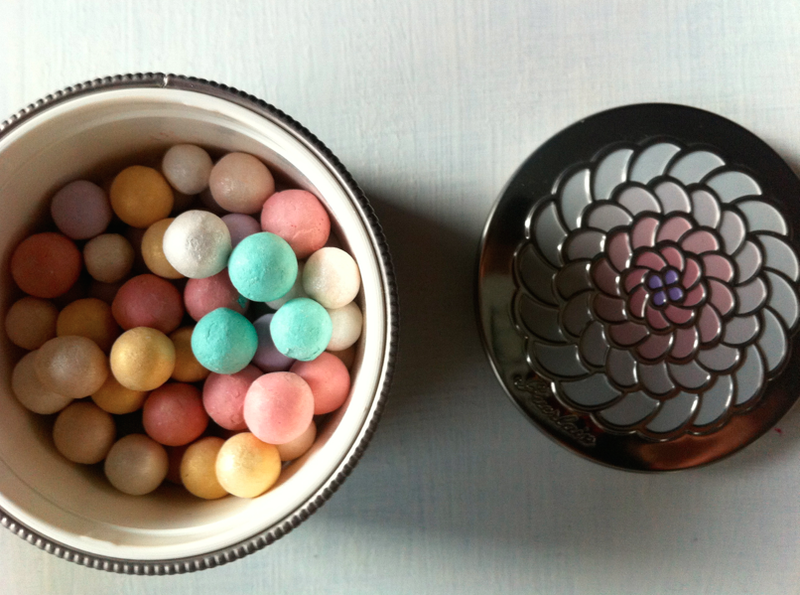 They’re probably the most luxurious loose powder of all times. Delicately scented and packed into a jewel-box, they’re an absolute elixir to restore radiance. I swirl my powder brush on them, and then sweep all over the face, first of all along the ‘T-line’, but also on the cheeks. This powder doesn’t dry the skin, but if you have any shine troubles, it will help mattifying. Look at how beautiful they are! To sneak a little more light into your day, and in your make up, lipstick is really important. When I was younger I used to think eye make up was the most important part of a beauty routine, but now I know I was quite wrong. Have you ever seen the difference on your lips and face between with and without red lipstick for instance? On all very fair skin tones, red has the incredible power to brighten up the look, like nothing else can do. Whenever I’m wearing red, I feel like the lipstick was saying ‘Hello!’ to all the people I see. As if it was making me ‘alive’. Another pick I always try to keep at hand is a Sephora red liquid stain. It has a mat finish, though it doesn’t feel too dry once applied and looks very pretty, yet affordable. Last but not least, of course, the best item to add light to your day is a generous spray of perfume. Of the perfume you love most. And I will not add any more words on mine, because recently I’ve spoken of J’adore even too much on this blog. This is more understated than the previous two items, unless you buy or like a too heavy and oriental fragrance, but if you stay on flowers, it won’t offend anyone’s nose. If you’re lucky, as I’ve been lately, thanks to a couple of sunny, though still cold days, both in Italy and now in London, don’t forget your sunglasses! Not because sun beams are necessarily dangerous, but because they can become one more accessory to give light to your day and look. It all depends on the style you choose. I found these transparent ones below at H&M and I liked them at first sight. 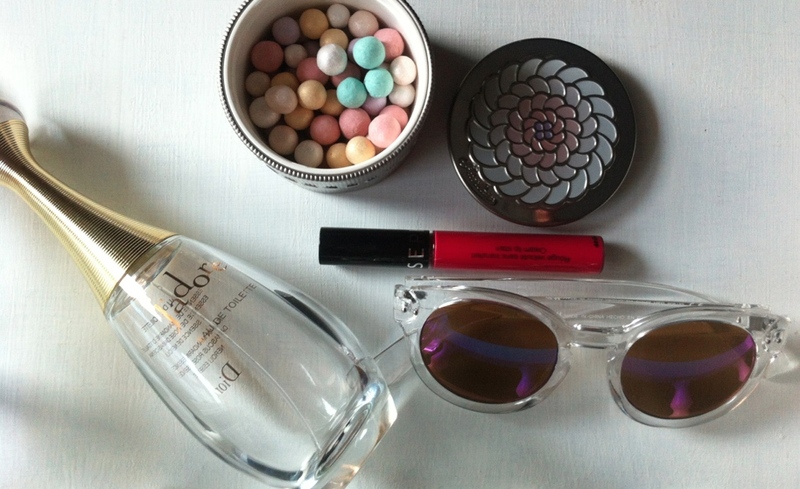 This entry was posted in Beauty, Fall/Winter, Fragrance, Make up, Season and tagged accessories, Dior, fashion, Fragrance, Guerlain, H&M, liquid lip stain, Loose powder, Sephora, sunglasses. Bookmark the permalink. That my eyes look tired if i dont apply an eyeline .. But besides that .. I really loved everything you added !! Great picks lovely! Have lots of fun in London! Wow, thanks a lot Annie, you’re such a mine of good suggestions! There’s a CT’s corner not far from where I’m, so I’ll give it a go for sure, bringing your recommendations at hand. I know it will be hard to select, in any case 😉 and I’ll post something soon, after my shopping. Yes to Meteorites, and red lipstick! Did I pick up that you recently traveled to London? My mind is still reeling from my 48 hours in London last September. What a fantastic city! Did you do anything fun in particular? Hi Jackie! I spent there 3 amazing days and I will be posting soon about all the beautiful things I’ve experienced there…I’m still day-dreaming! Yay. I can’t tell you how excited I am for the post! !